Have you used Kahoot yet? If you haven’t, you’re in for a treat! 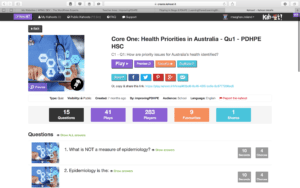 Here is a list of 4 Kahoot games we have created for Core 1: Health Priorities in Australia. Each Kahoot game focuses on one critical question from the HSC PDHPE syllabus. Use these games as pre-tests and/or post-tests with your students before/after learning each critical question. Critical Question 1: How are priority issues for Australia’s health identified? Critical Question 2: What are the priority issues for improving Australia’s health? Critical Question 3: What role do health care facilities and services play in achieving better health for all Australians? Critical Question 4: What are the priority issues for improving Australia’s health? You will need a laptop connected to a projector for the “master controller” (i.e. teacher) and each student/each team will need their own device. If you have not played Kahoot before and want help in understanding how to use it, watch this video we found on YouTube by the creators of Kahoot.